Know what makes SnapTube unique. 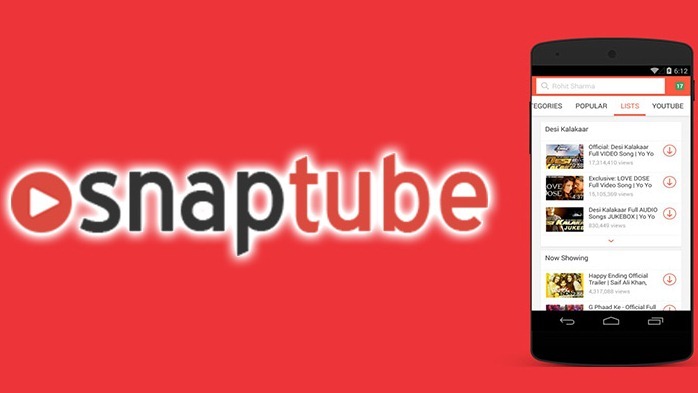 SnapTube is one of the most well known of all Android applications. With the humongous number of downloads that are clearly visible from Google's play store, it is quite clear that the popularity of the app is not going to wane anytime soon. However, what sets the SnapTube app really apart is that the content which can be accessed using the app is very rich in quality and varied in content. We discuss some of our most favourite content below. The first content factor we love is SnapTube's ability to use keywords whilst searching for music. We know that SnapTube is not to be taken lightly when searching for and downloading music. Imagine a user who is a first-time listener of Pink Floyd. Now, the legendary band has been in the business for more than four decades now. To aptly sum up its legacy within one single song is, therefore, next to being impossible. But with keyword search, the same user will now be able to leaf through such timeless classics like 'Another brick in the wall', 'Wish you were here' and the classic A Momentary Lapse of Reason. Two words which can be used for the keyword search in the same example are progressive and psychedelic. The inbuilt search functionalities will also be able to redirect you to other great bands who fall in the same category. Our recommendation is The Grateful Dead. Our next favourite act in SnapTube's arsenal of features is the introduction of a variety of resolutions available for download. The variety of resolutions available will also make viewing as interesting as listening to music, which has traditionally been SnapTube's oeuvre. Not anymore. With the resolutions as low as 144p and as high as the current favourite 1080p, the options are also increased substantially. It is interesting to note that in many large countries in the world, a lot of people still depend on feature phones to serve their entertainment appetite besides serving the obligatory standard features. Thanks to SnapTube. in remote cities and towns too, the best of what YouTube has to offer is now extended from Sudan to Sri Lanka. Our next best feature is that SnapTube will allow users to directly download MP3 files. While this may not sound like much on paper, the lessening of one step, converting downloaded videos to audio MP3 files, is also very important in making an app successful. The user need not download a separate software to convert the file into an audio file. This will result in less bloated software while ensuring that the device's memory is protected as well. Lastly, we love SnapTube's ability to let you discover and identify new videos. As a matter of fact, the SnapTube app employs full-time curators to help users identify and listen to new videos. The curators do a fine job at helping us increase our horizons as well. We hope that you will download and love the SnapTube app as it is so very helpful. The files are very lightweight as well.